The National Statistical Institute presents to users of statistical information the bilingual (Bulgarian/English) publication Household budgets in the Republic of Bulgaria 2017. The edition contains data from the sample survey of household budgets in Bulgaria for the 2006 - 2017 period. The publication presents the results from the survey of households and their budgets: structure of the households and their members by socio-demographic characteristics, amount of income by sources, amount of expenditure by purpose, consumption of basic food products, and caloric contents of the consumed basic foods. The results are presented in groups by the following indicators: place of residence, size of the household, number of the employed persons in the household, number of children in the household, annual total income per member of the household, presence of retired persons in the household, professional and socio-economic status of the head of the household and deciles groups. The information in the publication is intended for a wide number of users - state institutions, carrying out state social and economic policy, public organizations, economists, students and other. 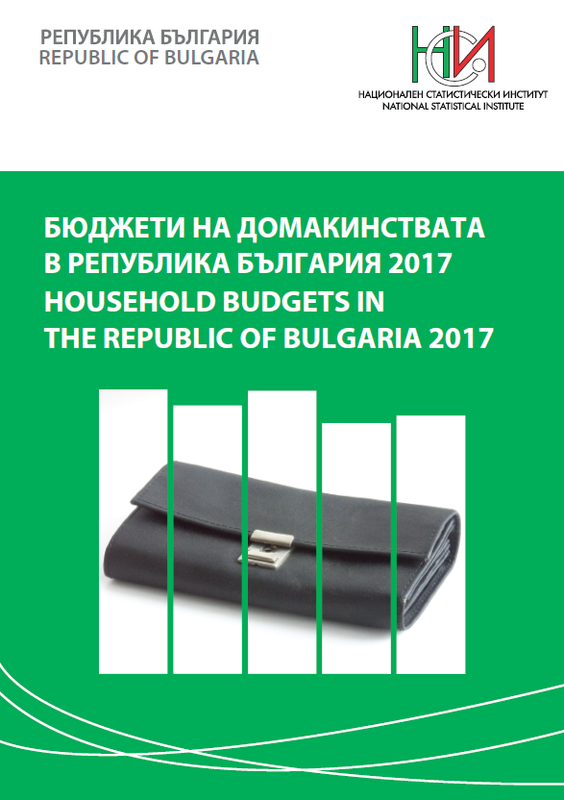 Electronic edition of the publication "Household budgets in the Republic of Bulgaria 2017"